For more detailed information please consult the document “African swine fever” virus in wild boar in Belgium (link). On the 13th of September 2018, African swine fever (ASF) virus was confirmed for the first time since 1985 in 2 wild boars in the municipality Etalle (province of Luxembourg). Up until the 15th of March 2019, 1984 carcasses of wild boar have been analyzed for ASF in zone I and II, among which 687 have been confirmed positive for African swine fever. All the infected carcasses are located within the high-risk zone II except for the last 5 cases which are located in northern part of the zone I .The zoning will be adapted soon. There are no outbreaks in domestic swine. No domestic and captive swine remain in the initial infected zone (decision of the Federal minister of Agriculture to eradicate all domestic swine by 2 October 2018). Strict measures have been taken for the whole country to prevent contamination of domestic swine. Based on European legislation and following consultation with the federal authorities and regional Walloon authorities, the initial "infected zone" has been replaced on the 27th of November 2018 by two separate zones: "Zone I" and "Zone II". This formal decision is imposed by European legislation in the context of zoning and protection measures against ASF, according to the identified risk. (see map below). African swine fever is limited to wild boars in a small area of the southern part of Belgium, there are no outbreaks in domestic swine, and the necessary and preventive measures are taken to control and avoid dissemination of the disease. All domestic swine in the initial infected zone has been eradicated under the supervision of the FASFC and the repopulation of farms in this zone is forbidden. 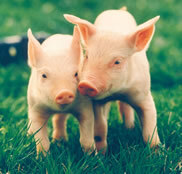 No products of these eradicated swine entered or will enter the food chain or will be used in the feed industry. Notwithstanding, the certification conditions laid down in the relevant protocols concluded between Belgium and the non-EU countries (third countries) will be scrupulously respected. Taking into account the definitions included in Chapter 15.1.3 of the OIE Terrestrial Code, Belgium lost its disease-free status for African swine fever in all suids. Belgium currently still has a free status for domestic and wild pigs kept in captivity. Measures are taken as provided in Article 15 of European Union Directive 2002/60/EC and supplementary national regulations. The detailed information about these measures can be found in the following document (PDF). On the 13th of September 2018, African swine fever (ASF) virus was confirmed for the first time since 1985 in 2 wild boars in the municipality Etalle (province of Luxembourg). 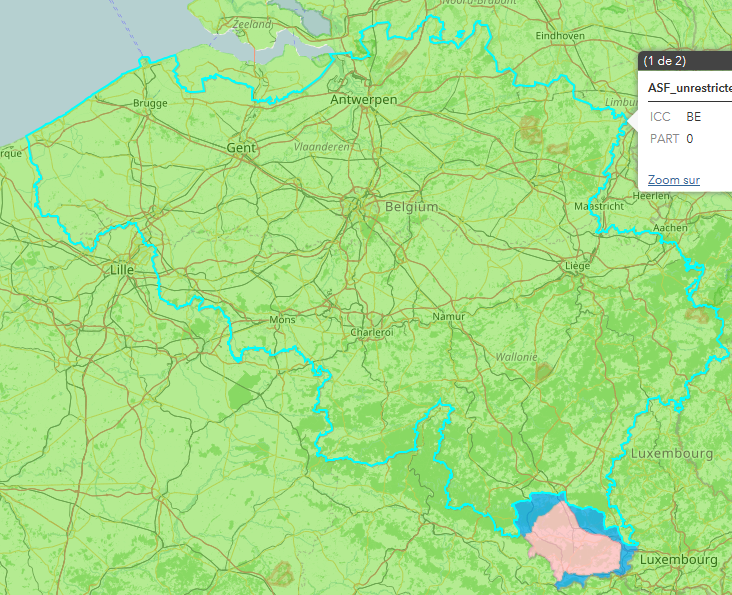 In this region very few domestic pigs are kept (most swine farms are located in the northern part of Belgium). The Federal minister of Agriculture has decided to eradicate all domestic swine in the infected zone by 2 October 2018. It must be made very clear that his is merely a preventive eradication to prevent the contamination of domestic swine and to protect animal health and the commercial interests of the Belgian Pork industry. It is certain that products of these eradicated swine will not enter the food chain or be used for the feed industry. Compensation for the destroyed domestic swine of all affected farmers will be provided by the Sanitary Fund (Belgian) and European funds, reserved for animals disease outbreaks. Other economic compensation will be provided by the Walloon Region. It should be emphasized that the potential risk lies in the spreading from wild boars to domestic and captive wild pigs, but that this risk is very limited since the necessary measures are taken. Annex 1: Council Directive 2002/60/EC of 27 June 2002 laying down specific provisions for the control of African swine fever and amending Directive 92/119/EEC as regards Teschen disease and African swine fever. Annex 2: Commission Implementing Decision (EU) 2018/1242 of 14 September 2018 concerning certain interim protective measures relating to African swine fever in Belgium, and its Annex detailing the areas that should be comprised in the infected zone. Annex 3: Commission Implementing Decision (EU) 2018/1281 of 21 September 2018 concerning certain interim protective measures relating to African swine fever in Belgium, and its Annex detailing the areas that should be comprised in the infected zone. Annex 4: Official CVO attestation of the OIE status of Belgium as “ASF free for domestic pigs and captive wild pigs”.